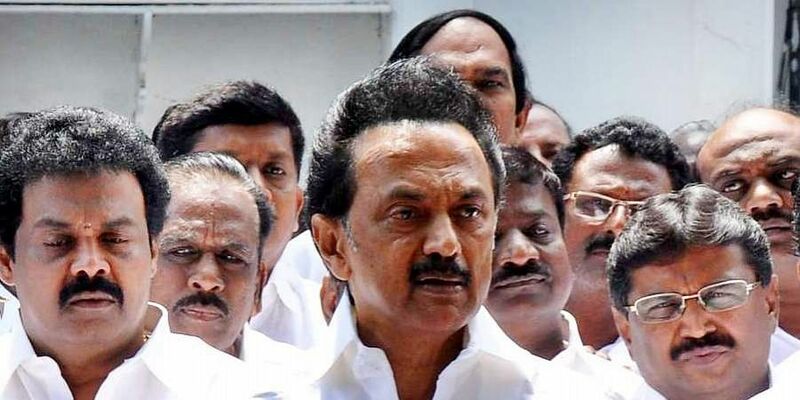 DMK president MK Stalin on Monday announced, unilaterally, that his party would contest from all 18 Assembly seats that will face by-elections on April 18. CHENNAI: DMK president MK Stalin on Monday announced, unilaterally, that his party would contest from all 18 Assembly seats that will face by-elections on April 18. The move comes as a snub for Congress and the Manithaneya Makkal Katchi, who wanted to contest the bypolls as part of the DMK-led alliance. Even while seat-sharing negotiations for Lok Sabha polls were underway, Stalin had said that discussions regarding by-elections could happen only after polling dates were announced. However, his announcement has left little space for allies to negotiate. Stalin gave the details while speaking to the media after a meeting with his district secretaries, at the party headquarters. He said the identification of constituencies for allies, barring the Congress and VCK, was over. An announcement in this regard would be made in a couple of days. Congress leaders have not reacted to Stalin’s statement. The grand old party had contested from two of the 18 seats going to polls now — Ambur and Sholingar. Reacting to the development, MMK chief MH Jawahirullah said: “We are firm that we should contest polls on an independent symbol. DMK wanted us to contest on its Rising Sun symbol. Since this is a bypoll, DMK has decided to fight on its own.” Speaking later in the day, VCK chief Thol Thirumavalavan said the constituencies for them had been finalised and Stalin would give the details soon. When asked if VCK would contest on DMK symbol, he said that too would be revealed by Stalin.